Established in 1994, the client is a well-known medical foundation, with over 270-bed hospital based out of Avon, Indianapolis. The hospital manages more than 28000 emergency room patients per annum and is renowned for its post-surgery rehabilitation care. The client was facing challenges with their medical billing and revenue cycle practices and wanted to revamp their EHR software. This was a resource-intensive task which required them to process around 3000 individual rehabilitation cases, carry out the transcription for each, digitize & store in an electronic format. 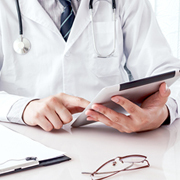 Though our client had an enormous amount of data, they were still relying on the traditional medical billing process. We had to cover all their historical medical data and convert those in the digital form and also bring the entire billing practice online. We started by understanding their documentation needs vis-à-vis their rehab facility standards. Convinced with our experience in medical transcription, EHR selection, implementation, and optimization, the client approached us for a solution. We formed a cross-functional team of rehab doctors, nurses, medical transcriptionists, and EHR software experts. This enabled us to sort out the key data types for conversion and also helped us identify the information that should be presented to the patients during their visits. Our experts sorted out the patient demographic data, medical history, and their current medication program. We were also able to bring in order the key components of patient medication program, including, patient's allergies, problem lists, etc. Thus, we were able to find the volume of the data that needed to be converted. This way we started the scanning, interfacing and identifying the data. At every stage of the data conversion phase, our medical transcriptionists were in contact with the rehab specialist so that they could follow all the medical & compliance guidelines. We made sure that our data entry executives get only the most accurate, sorted, and clear data. This expedited their data-entry procedure and also helped us to parallelly execute the auditing process. Altogether, we were able to convert the data into digital format within the stipulated time and with 100% accuracy. Being an ISO 27001: 2013 certified medical transcription company in India, we have been a leading provider of Rehabilitation Transcription Services, and a plethora of other Medical Transcription Services. Our medical transcription team comprises some of the most talented transcriptionists, data-entry experts, reimbursement experts, billers & coders, healthcare insurance support executives, etc. They can recover your facility from any backlogs, improve cash flow, and modernize the administrative operations by moving your medical data to EHR software. You can also collaborate with us to improve your organization's productivity, increase your employees' utilization, and boost the reimbursement rate. If you are looking for an accurate, quick, and cost-effective medical transcription services, then, look no further. Get in touch with us today!